Actor turned Politician, Chiranjeevi enjoyed his birthday party with Southern industry and Bollywood celebs. enjoyed the Birthday celebration of Chiranjeevi when he turned 60. Salman seemed to chat with southern industry, particularly with Venkatesh. 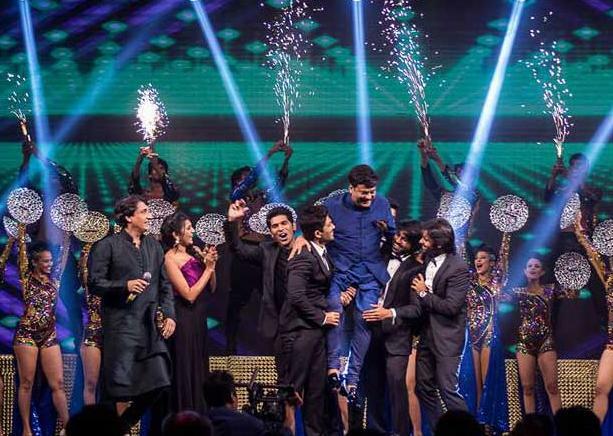 The celebration was arranged by Chiranjeevi’s son Ram Charan Teja at 5 star hotel of Hyderabad. Ram Charan and his wife Upasana welcomed the guests and host the party as well. Chiranjeevi’s younger brother Pawan Kalyan, a Telugu matinee idol was also present at the party, who positioned far away when he took a decision to join Praja Rajyam Party (PRP). Chiranjeevi will soon be working on his next upcoming 150th film, which will be made under film maker Puri Jagannath.